Enjoy precision engineering and European style in a used Volkswagen vehicle from Prestige Volkswagen near Palm Bay, Florida. You’ll love the responsive handling of the roomy Volkswagen Passat on US-1 along the Indian River, or the fuel efficiency of the VW Jetta sedan. The Volkswagen Golf will put you in control of the road with impressive power, while an the iconic VW Beetle is a practical hatchback that provides retro fun. The Volkswagen Tiguan is the whole package, a small crossover with three row seating and plenty of room for gear. Browse through our current used inventory today! Find a used Volkswagen model at your local Palm Bay, FL Volkswagen dealership. At Prestige Volkswagen, we are a family-owned business deeply committed to our community. At our used Volkswagen dealership near Palm Bay, FL, we stock only quality pre-owned VW vehicles that we know will deliver great value for years to come. Check out our used specials, then visit us in Melbourne, FL to test drive a Volkswagen CC Sport or Volkswagen EOS convertible today. Our experienced finance team will walk you through your used car purchase with competitive pricing and a payment plan that works for you. Get a jump start on the process with our secure online application form and payment calculator. 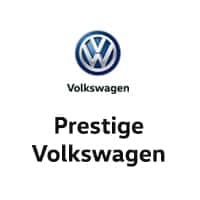 At Prestige Volkswagen near Palm Bay, FL, we make purchasing a used Volkswagen vehicle easy. Give us a call today to learn more!